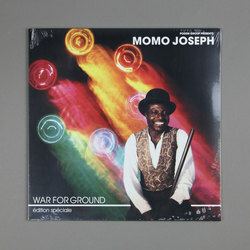 Momo Joseph - War For Ground (Édition spéciale). Vinyl LP. Bleep. You may recognise Momo Joseph from his movie roles - he has appeared in films including 1995’s seminal La Haine - but the Cameroonian artist also had a side hustle in music back in the ‘80s. His only LP, War For Ground, is a rare Afro-boogie gem. Originally issued in 1983 as a 4-track LP, this new Africa Seven edition bulks the record out with some Joseph rarities - ‘Cameroun Airline’ and ‘Love Africa Soul’, both put out on the same single in 1980, are excellent disco-indebted additions, while the previously unreleased version of ‘Oh Momo’ is a great bit of Afro-funk.